This blog post took 10x longer than I expected because as I started writing it, a lot of nostalgia resurfaced, which lead me to look through hundreds of old baby photos of Mona and me, and then progressed to some sweet, long conversations about memories and friendship with the one and only. Also, I’m writing this at night so feels are like at their peak right now. Before I get into the rest of this post, I want to note that I’m going to make a separate blog post focusing on this trip to England, France, Italy, San Marino, and Switzerland next (stay tuned!). In brief and to help give this blog post some context before my other one is up, Mona and her family invited me to a 3 week-long trip throughout a few countries in Europe this past summer. 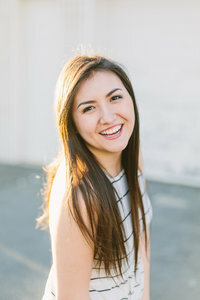 While there, we stopped casually and sometimes not-so-casually along the way to take her senior pictures, which is what compiles this blog post. My time with them was unforgettable – but more on that later. I can’t remember a time in my life when Mona and I were not friends. Our moms met at work and used to go on walks while pregnant together, so our friendship was naturally ordained since birth. Even though I had a pretty bumpin’ social life as a toddler, Mona has remained in my life longer than anyone else I was friends with waaay back in the playdate, baby food era. In my whole life actually. Many of my happiest and most mischievous memories as a child are associated with Mona – we were quite the energetic, creative, and carefree duo, to our parents’ demise. Some of our mischief included depleting Mona’s first-aid bandage supply by sticking every single darn band-aid we could find on our body just because, covering our skin in clear glue in order to try and trick our parents into thinking we were sweating (don’t ask me why), sharing toilets (sry mite b 2 much info), pulling out Mona’s hair as a kiddo (sorry Mona), stuffing our pre-pre-teen bikinis with socks and strutting around the house, amongst so much more. When I think of Mona and me, I remember feeding the ducks in Old Town, making dances to “My Girl”, blackberry picking fights, movie nights ’til early in the morning, family dinners, wearing inverse pajamas, Wee-Sing the movie, spending every Halloween together when I lived in an apartment, attempting to make dinner for both of our families and consequently not eating until midnight, tennis camp, ballet, climbing on top of the fridge, Rehoboth beach and the haunted mansion, testing to see if we were mermaids by experimenting with underwater breathing, sledding every winter, and more. But mostly laughter. So much laughter. Literally peeing of laughter a majority of the time we’re together. NO one makes me laugh harder than Mona does. Each of my friends & relationships get me in ways no one else ever could. My friendship with Mona is different because it is associated with family – roots – which is attachment in one of its purest and strongest forms. Our quirks and idiosyncracies that may bother or seem weird to other people feel like home to us. Mona was there throughout all of my transitional phases, adolescent firsts, and minor details of my life that could never be understood through words. Her family is my family, and vice versa. And I would do anything for her. Anyone who has the privilege to get to know Mona can easily see how dang special and different she is. She has one of the absolute purresstt, happiest hearts I have ever encountered, and brings out the child in each person she meets. Plus, her laugh is crazyyy contagious. She accepts me, genuinely listens for as long as I need and more, supports me through everything, gets me, and loves me for me. We’re forever friends. English tea at The British Museum! Montmartre – one of my favorite places we visited in France. Also, this liiiighhhtt. Your photos are AWESOME!!!! WOW!! BRAVO! Your photos are breath-taking. Your attention to details, picking the perfect location, catching the right moment for the photo and your overall photo skills are just amazing.